Once I showed up to speak to an audience of three hundred and there was no microphone. Another time the remote wouldn’t advance my slides. And still another time, the projector bulb blew up in the middle of my speech. Technical mishaps happen. It’s how you deal with the mishaps that will reveal your level of professionalism and confidence. 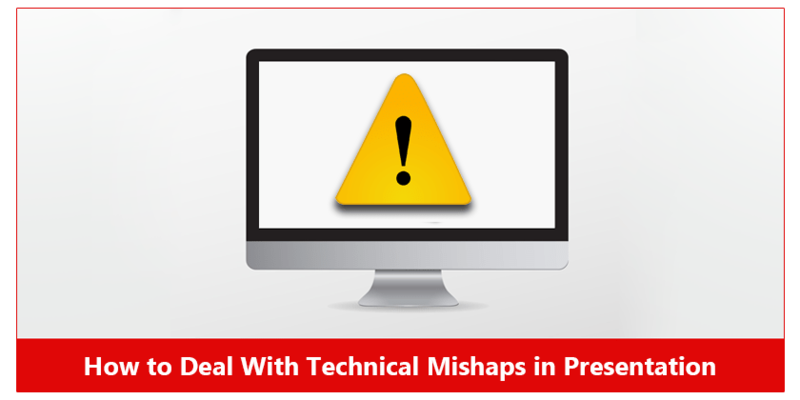 Here I am going to tell you how to deal with technical mishaps in presentation. Three pro tips to help you keep you cool when you feel let down by technology or equipment failures. When it comes to presentation technology, over prepare. Use a checklist to make sure you have everything you need to present, including backups. Show up early and test everything. I can’t count how many times event coordinators have told me that they would provide absolutely everything–computer, remote, projection system–only to find an item or two that simply didn’t work. If you can, pack some of your own items. Bring your own laptop and remote for example. Even if you don’t need them for your presentation, having them on hand gives you a quick backup plan in case somebody else’s equipment fails. Secondly, know your presentation cold. If your presentation technology goes into total meltdown during a live performance, you can always go on without it. I was delivering in out of town training session, when the projection bulb blew up about 50 minutes. I couldn’t stop to fix the bulb, instead I asked the staff to work on the problem while I continue the session. They never did fix the problem, but I kept right on going. Always know your material, you look like a polish professional when you rise above, any technical glitch you might encounter. When you feel that technology is feeling so badly that there is absolutely nothing you can do to salvage the presentation, there is still one thing you can do. Get your audience involved into problem. Remember a business audience can be extremely empathetic to technical problems, it has happened to everyone to someone at some point. I remember when it happened to me then, I asked the audience, how they want to precede. We all decided to call our families to make sure they were okay. So get your audience involved in your technical or situational problems, instead of being completely dazed, you can use some of your worst technical issues to create a memorable emotional bound with your audience.